In October 2001 the distressed pastor of a parish spiritually devastated by the mismanagement and bad example of others, by the infighting among the faithful, by the growing indifference and increasing defection of Catholics to small evangelical sects, led him to ask the president general of Heralds of the Gospel, Monsignor João Clá Dias, then still a laymen, for help. A significant number of Heralds, almost three hundred young men and women, were called upon to carry out a vast mission of evangelization throughout the parish territory over a period of three days. At the closing Mass of the mission, such were the number of faithful that they could not fit into the church and crowd flowed into the surrounding streets. The first pews were filled with several families who had abandoned the Church and joined one or another evangelical sect. 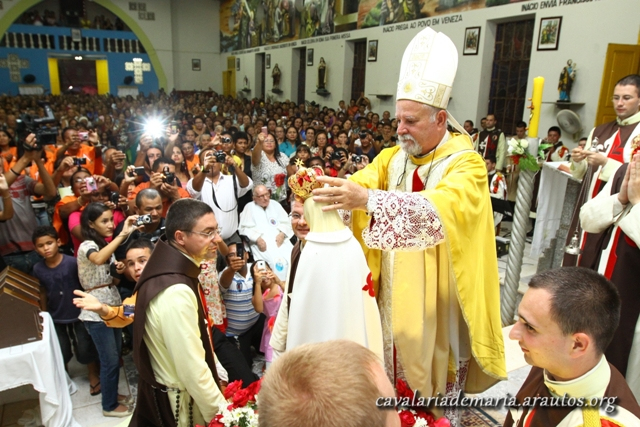 Having witnessed the joyful proclamation of the gospel they expressed their desire to return to the full practice of their faith in the Catholic church. While members of Heralds of the Gospel had regularly been engaged in activities in parishes and dioceses, the experience and success of this mission opened the avenues to idealize and develop a new method of apostolate: Marian Missions. Carried out on a regular basis, they have since spread worldwide and have become a hallmark of the apostolate of Heralds of the Gospel. For example, from local ethnic communities in Canada, the missions have been organizes and carried out in Trinidad and Tobago , Haiti and Rwanda. Small groups of Heralds, each carrying a statue of Our Lady, and visit homes, schools, and businesses in order to evangelize. 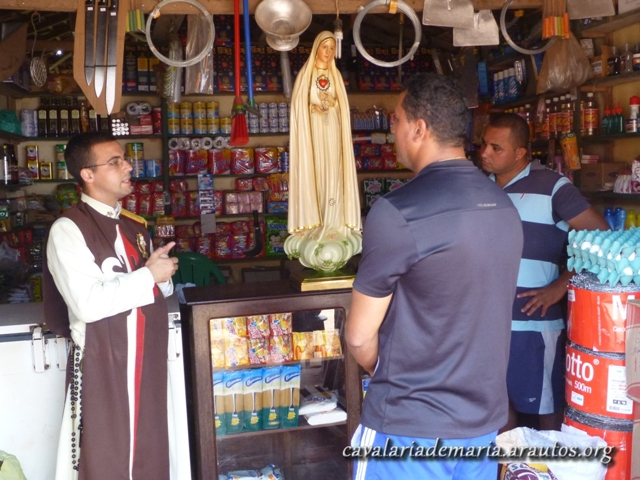 Marian missions are initiated at the parish level, usually at the request of the pastor, but, at times, a group of parishioners may express their wish for a mission directly to Heralds of the Gospel. In the latter case, they must obtain a formal invitation from their local pastor. Once an invitation has been received an advance team contacts the pastor in order to development the plan for the mission taking into account the pastor’s instructions and guidance, the scope of the mission, the areas to be reached. After the scope and territory to be covered have been delineated the area will be scouted out and divided into manageable sectors so that an appropriate number of Heralds can be designated for the mission. 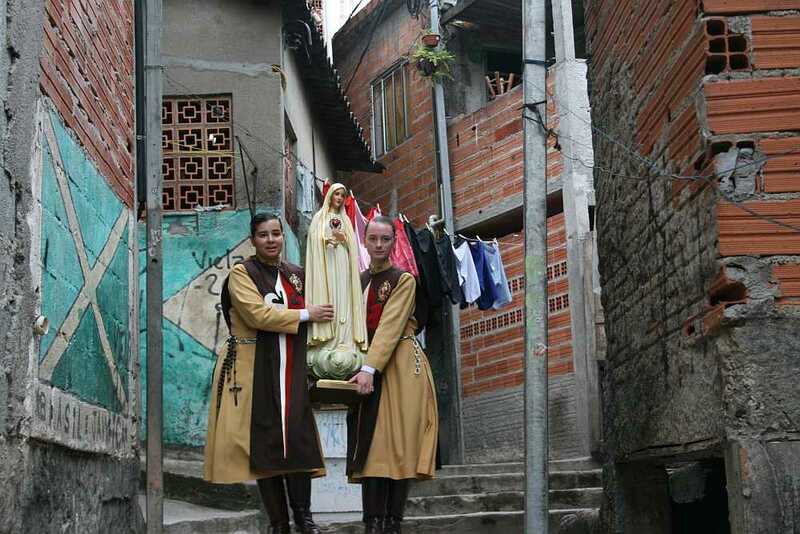 On the first day of the mission, dozens of young people will be divided into groups of six or seven persons and each group will receive a statue of Our Lady. Beginning at the parish church, these groups will go out carrying the statue and walk the streets of the parish, going door to door, and offering an opportunity for the statue to visit homes, schools and businesses and to pray with those present. After a few words of encouragement and catechesis, the youthful teams will invite the individuals to the evening Mass that day and to the much more solemn closing at the end of the mission. 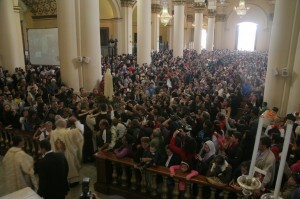 At the same time they distribute free religious material, such rosaries, devotional books, little medals and the like. On average, missions will last for one week, depending on the size of the parish and the number of missionaries available. In addition to the benefit of the homes in the parish this apostolate brings, this activity is an exceptional way to train young people to be missionaries by strengthening their own faith and giving them the courage to proclaim it. It is a very effective way to introduce young people to the work of evangelization and responds to their eagerness to act. For this reason many of them choose to participate in ongoing missions during the holidays, when they could otherwise be spending their time is some leisurely activity. 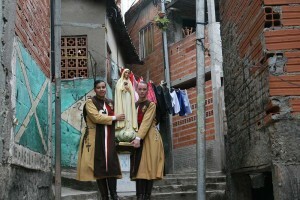 Heralds of the Gospel in Brazil has established a specialized group whose purpose is to continuously carry out Marian missions called the “Cavalry of Mary”, who have continuously crisscrossed the country since July 2002 and have traveled hundreds of thousands of miles visiting more than three hundred thousand homes and other establishments in nearly five hundred parishes.